The best of street food at home. 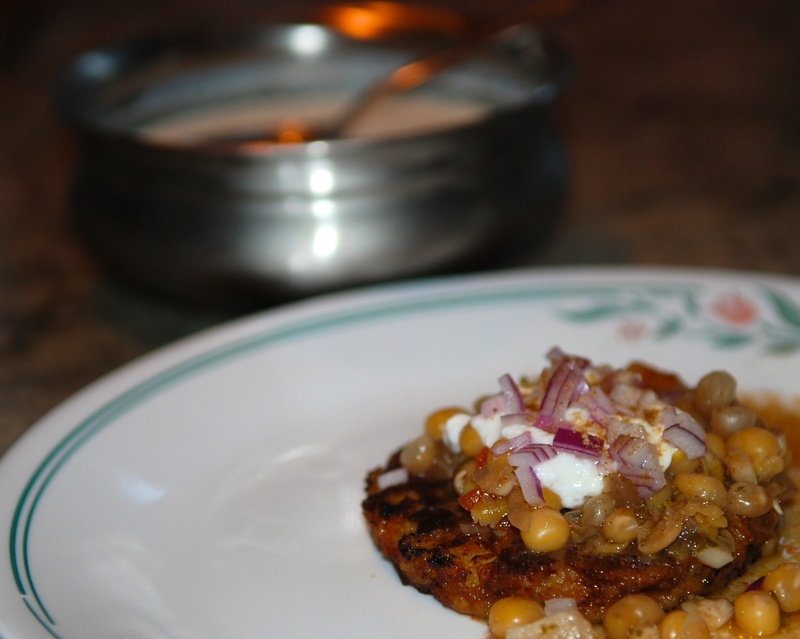 Pan-roasted Trader Joe’s Masala Burger, topped with basic ussal, yogurt, chopped onions and chaat masala. I used TJs Masala Burger for these Quick Pattis Roll-ups too. That was some innovation. To use our very desi lingo ‘sahi jugaad’. I can imagine you guys must be missing these indian street foods. We have Kailash parbhat outlets all over mumbai now (yep; they too have given in to franchising et al). They are all good but nothing comes close their original outlet at colaba. I Know, I was recently in Mumbai and the Phoenix Mall in Parel had a Kailash Parbat outlet! Yaay! and the quality was perfect. So however they did it, they got the scale-up just right! And yes, there is absolutely NO Indian street food here. A lot of Hot-dog, hamburger, korean, chinese food carts around offices/universities and only for lunch, after that ZILCH! What a great idea–using a veggie burger–to get a quick Ragda Patties fix! Amazing no? Also look at the Pattis Roll-ups I do with this same burger for a quick meal. We need more quick meals.